Guests on Thursday’s Wake up with the Whales Cruise got the opportunity to know a very active Humpback. 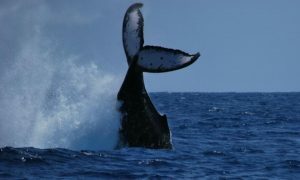 We first saw this whale offshore of the Hilton Waikoloa Village – actually we were alerted to his presence by all the splashing we saw. Even from quite a distance we could see he was slapping his pectoral flipper repeatedly on the surface and he continued slapping off and on for most of the time we were out there. We also saw him do a few peduncle throws. Why was he doing all of this? We’re really not sure, as we didn’t ever see another Humpback close by. When we could tear our eyes away from him, we saw spouts from a couple of other lone Humpbacks a way’s away in various directions, so maybe our pec-slapping peduncle-throwing whale was lonely and attempting to attract a few other whales over to his area…or maybe he was frustrated that he couldn’t find a female…or maybe this whale was a female, and she was frustrated that no males were paying attention to her. Your guess is as good as ours! It was like we were in a different ocean for our Mid-Morning Cruise, though Kawaihae is really only about 10 miles “as the crow (or ‘Alala) flies” from Anaeho’omalu. Guests joining us on this cruise got to spend time with two very calm Mom/baby pods. We watched each calf dive down to her waiting Mom multiple times, and when the Moms surfaced, it was just to spout a few times before calmly slipping under the water again. Where were the Escorts? We never saw any male Humpbacks, but when we deployed our hydrophone we heard lots of loud, very clear voices, so we knew they were somewhere near by. Have a wonderful weekend. I’ll send out our next report on Monday. Ocean Sports Whale Fact of the Day: Throughout this season, I’ve mentioned the “peduncle throw” many, many times. But what’s a “peduncle”? We call the region between the whale’s flukes and his main body, a “peduncle”…but why such a strange word? I was wondering about the etymology of the word, so I looked it up. Turns out that the word “peduncle” comes from the Latin word “ped” which means foot. It was first used to describe the stalk of a flower, fruit, or tumor. I guess that makes sense…the back part of the whale does sort of look like a stalk, bearing the whale’s wide flukes.